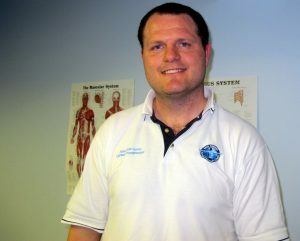 Welcome to New Forest Physiotherapy Southampton. The clinic opened in Gang Warily Recreation Centre Fawley in September 2007, with a second clinic opening in Southampton in June 2012. Offering physiotherapy and sports massage treatments for musculoskeletal injuries, including sports injuries, back pain and whiplash, I am committed to providing the best possible care to my patients. I am dedicated to helping you recover from pain, achieve your fitness goals and return to the sports and activities you love. In April 2016 the Southampton clinic moved to Easy Gym in Southampton. The Gang Warily clinic moved to Forestside Medical Practice in Dibden Purlieu in May 2017. The clinic was born at Gang Warily in September 2007, but it was conceived 9 months earlier as I approached the end of a 4 month tour of Afghanistan. I decided to set up a clinic where I could run things were the patient’s goals come first, not the needs of the system in which I was working. Having qualified in 1994 I had a great deal of experience working for the NHS, Private Hospitals and the Military. My experience was that the system often limited the way I could treat my patients. Within the NHS, long waiting lists mean there is an emphasis on patient self-management and home exercises; Medical Insurance also has its limitations, with the number of treatments that an insurance company will pay for often being limited. Military physiotherapy cover was by far the best, as it enabled me to return patients to full fitness and beyond. The budgetary constraints that exist within the NHS and Medical Insurance are completely different in the Military; it costs the Military money if a recruit is injured and unable to complete their training, or could result in a soldier being sent back home from an operational theatre like Afghanistan. As a result the physiotherapy cover that I was able to provide was excellent, with daily treatments possible and excellent gym facilities. Patients continue attending physio until they can complete their personal fitness tests, including an 8 mile run with heavy equipment. My dream on returning from Afghanistan was to establish a clinic that returns patients to full athletic ability, so that they are fitter than before they had their injury; Beyond Your Best. To ease your pain and improve your musculoskeletal health, through the use of physiotherapy techniques and education, so that you return to full athletic ability, know how to prevent further injury, and can do the sports and activities you love. If you are not entirely happy with the treatment you receive from us we will give you a full refund of your treatment fees.